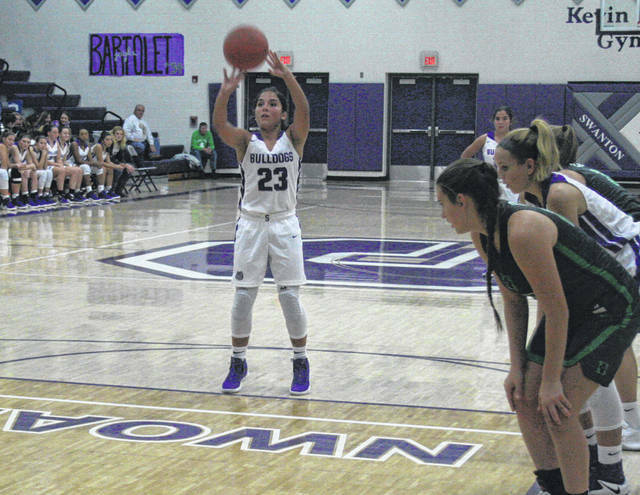 Averie Lutz of Swanton at the foul line during a game this season. She was recently named honorable mention All-Northwest District in Division III. The Ohio Prep Sportswriters Association has announced their all-district boys and girls basketball teams for the Northwest District. For Swanton, sophomore Averie Lutz was named honorable mention all-district in Division III. Delta senior Abby Freeman made first team all-district. Honorable mention all-district for the Panthers was sophomore Braelyn Wymer. On the boys side, Evergreen junior Mason Loeffler was named to the second team in Division III. Nate Brighton, also a junior, was honorable mention for the Vikings.